They have a lot of experience in the performance of this and many other cleaning procedures. Our agency has been providing reasonably priced oven cleaning services in London and the other parts of London for a couple of years. We can honestly say that we are among the leaders in the industry and we will gladly prove that to you once you give us the chance. You don’t have to struggle alone with the scrubbing and cleaning of all parts of your oven. We will be happy to save you from this unpleasant task by offering you our professional oven cleaning services. Because of the regular usage of your oven, it is perfectly normal to notice soon that your appliance is covered with stains and grime. The ordinary cleaning products you have won’t be able to remove everything, but our special eco-friendly supplies will erase it all for sure. Since they don’t contain toxic chemicals like the ones from the store, you can be a 100 % sure that you and your family will be safe. The constant cooking inevitably leaves its mark on your kitchen appliance, so it is a good idea to know how you can promptly clean the internal and external parts of your oven. You can reserve our professional services whenever you like. 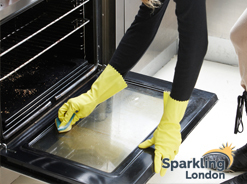 There is a reason why so many people from London and the area prefer to book our professional oven cleaning services. Our agency has an excellent reputation in the entire city because we not only offer perfectly affordable procedures, but we also perform them always on time and only with the best toxic-free products. ance of oven cleaning and other services in London and the surroundings. We will be very happy, if you decide to contact us and take advantage of our effective procedures. Our employees will come as soon as you call them and will start performing the oven cleaning service right away. They will erase all forms of pollution and will pay special attention to the cleaning of the stubborn greasy spots. Don’t hesitate any more and dial the number of our highly respected company. 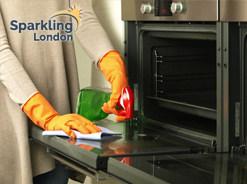 If you’d like, you can also book your oven cleaning service by coming to London and meeting with our friendly team. In case you have questions, our employees will answer all of them as well.